I've lived in Del Rey for over 6 years now. It is one of those "adjacent to" communities that no one has ever heard of, even most of the people that live or work here. 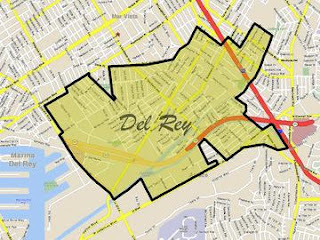 I am pretty familiar with Del Rey's identity (or lack of identity, actually) since I was involved with the Del Rey Neighborhood Council a few years ago. In Del Rey, we have Mar Vista Gardens, Marina Del Rey Middle School, Playa Del Rey Elementary School, the Culver City Median Bicycle Path, and the Venice Japanese Community Center just to name a few of the places including one of the "adjacent to" monikers in their names. If that's not proof of a lack of identity, I don't know what is. This weekend, to my surprise and delight, the Los Angeles Times ran a blurb about Del Rey in their Real Estate section's Neighborly Advice column Ready to Step Out of the Shadows. I found it interesting that the area was known as a good place to grow celery. I guess I should try that in my vegetable garden. Maybe this article will help raise the awareness that Del Rey actually exists. One day I may be able to tell a cab driver "Take me to Del Rey" and he/she won't look at me like I'm a clueless person trying to get to Marina Del Rey or Playa Del Rey.